This is a delicious berry cake filling that's easy to make and won't leak out of your cake layers. Add egg whites and powdered sugar to a stand mixer bowl. Turn mixer on medium (setting 5 on Kitchenaid mixer). As egg whites and powdered sugar is mixing, start adding butter, one chunk at a time. Add 1/2 of the butter. After adding 1/2 the butter, turn mixer up to high setting and continue adding the rest of the butter. Add the sea salt. Let the mixer run on high for 10 minutes to let the buttercream whip and mix accordingly. Stop mixing buttercream when it has turned white, if you stop too soon it will taste like butter and not frosting. While buttercream is mixing, place marionberries in a strainer over a large bowl and push out excess juice with a spatula. If your buttercream starts to creep up the edges of the side of the bowl, use a creme brulee torch to heat the sides of the bowl just enough so that the buttercream starts to slide back down. Don't overheat with the torch. After straining, put marionberries into a bowl. Roll lemon on a hard surface to get it ready for squeezing. Add a squeeze of lemon juice onto the marionberries. Squeeze bavarian creme into berries until there are equal parts creme and berries. Mix together with a spatula. When buttercream has finished and is white, remove 1/2 of the batch and set aside. 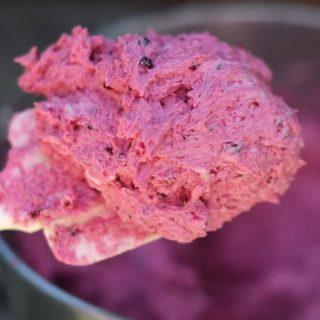 Add the berries to the mixer bowl and make sure there's equal parts buttercream to berry mixture. Adding buttercream to the berry filling will give it body and make it harden after putting the cake in the fridge to cool. This will ensure that the filling will not run out of the cake. Learn how to make this delicious Marionberry cake filling. Definitely gonna try it. Awesome!! Looks yummy. Just one question… what do I do with the other 1/2 buttercream from step 9? Can you decorate with this type of iceing? I’m not sure if I should put it in the cooler? This has fresh berries in it so it must be refrigerated but can be left outside for 2 hours before eating. Decorating is tricky since there are chunks of berries and seeds in the buttercream.